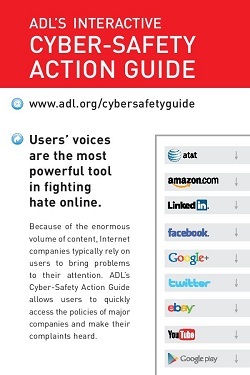 A 4"x6" one-sided card provides the URL for ADL’s Cyber-Safety Action Guide (CSAG). The CSAG is a unique online tool that empowers anyone to report online hate to Facebook, Twitter and many other sites with just a few clicks. It’s a powerful new weapon in the fight against online hate created by the Internet experts at ADL.